public accountability, and 4) technology and innovation for openness and accountability. Anchored on the PDP pillar of Malasakit or enhancing the social fabric, the PH-OGP NAP 2017-2019 was formulated at the start of a new administration which prioritizes the enhancement of citizen participation as one of the foundation elements of its good governance framework. The PH-OGP initiative is cited in Chapter 5: Ensuring People-Centered, Clean and Efficient Governance of the PDP 2017-2022. This chapter’s narrative, under the subsector outcome on citizen engagement and empowerment, specifically identifies the sustainability of the country’s engagement in the OGP as a key strategy to actively promote participatory governance and ensure that government policies, programs and projects are responsive to the needs of the people and brings back the people’s trust in government. Executive Order No. 24, issued May 16, 2017, which created the Participatory Governance Cluster of the Cabinet that is mandated to exert all efforts to enhance citizen participation in governmental processes. Linking the PH-OGP efforts to the broad and long-term initiatives of this Administration, the PH-OGP Steering Committee has set the direction of OGP in the Philippines for the next few years during a highlevel meeting held on October 2016. 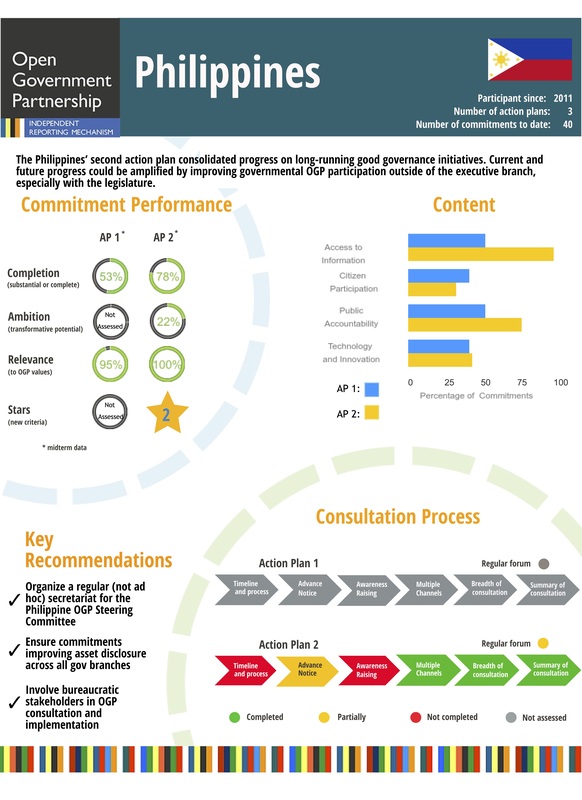 As significant reforms under the past three plans have gained ground in changing the culture of governance in the Philippine bureaucracy, the aim now of the PH-OGP is to expand its reach and impact by co-creating and implementing new action plans and open government programs that have concrete and direct benefits to citizens. Under the theme “Co-creating Governance Outcomes with the Filipino People”, the 4th PH-OGP National Action Plan, the first open government Action Plan crafted under the Duterte administration, is geared towards improving the quality of government service and the effectiveness of its impact through the delivery of innovative and effective government programs that promote transparency, accountability and citizen participation.